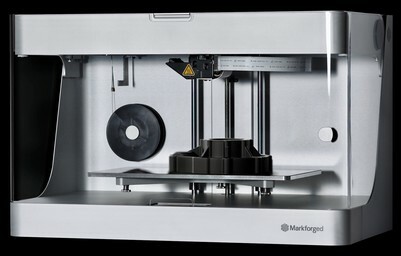 The Mark Two combines Markforged's unique continuous carbon fiber reinforcement with workhorse reliability for the strongest, most versatile parts in our portfolio. It is the only 3D printer in the industry that enables you to go from CAD to beautiful, strong, end-use parts in hours, making it ideal for manufacturing and industrial applications. With your choice of reinforcement fibers and plastics, the Mark Two 3D printer removes time, hassle, and design iteration constraints, allowing you to put parts to use right off the printer, engineered with the right material for any job. In addition to printing Onyx, the Mark Two industrial grade 3D printer uses materials that no other 3D desktop printer can, like Carbon Fiber, Fiberglass and Kevlar. 3D printing with composite fiber is as much about the software as it is about the unique technology of the printers. The Markforged Eiger 3D printing software is both powerful and easy to use in your browser, importing your drawing and slicing it for high strength printing. Contact us to find out more about nylon printing.